In the fall my sewing interests turn to quilting. I don’t know why, but the cool weather just reminds me of quilting. 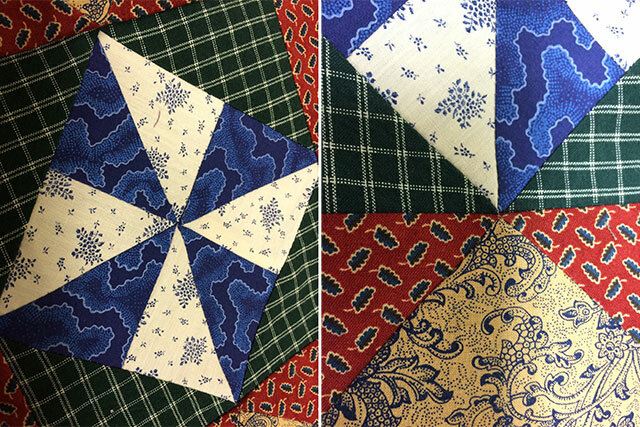 I especially love blue and “any color” quilts, but my current project is quilt blocks that are made from Civil War reproduction fabrics. I am using start patterns, and I just love it. My ultimate goal is to make a quilt using colors from each season so that my bed quilt can change. The blue and yellow sampler quilt was the first sampler piece I made in a class taught by Beth Hayes when we owned McCall’s Quilting magazine. Beth makes everything seem easy. She just retired from McCall’s Quilting where she has served as the editor since we launched the magazine and has left us with a legacy of quilting. It was from her I learned about the Civil War period of quilting fabric. There is something about the fabric patterns from that period in time that make me want to quilt. I guess I envision women having wonderful quilting gatherings and sharing scraps just like my grandmother did. The enchanting designs of fabrics from that period are so wonderful. They are very delicate but detailed. And the colors are spectacular. My husband told me that he absolutely loves quilts on a bed because it means “home” to him. I couldn’t agree more. These fabrics just speak to me and make me want to piece a quilt top. I told you about Riley Blake’s newest division called Penny Rose, and one of their launches for fall is the Civil War Time’s Miniature. These fabrics are scrumptious. 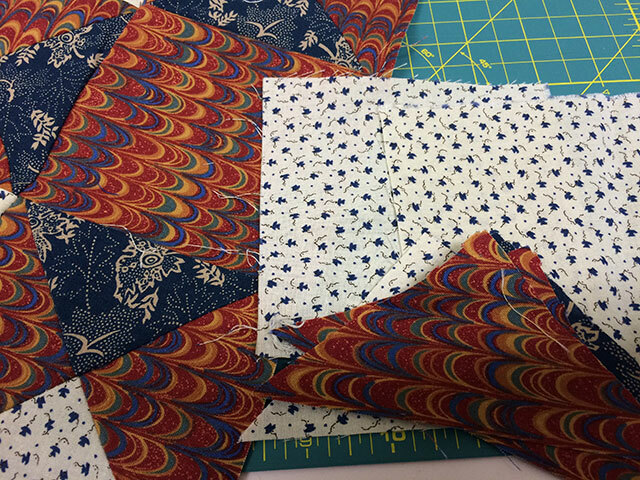 Cindy Cloward, owner of Riley Blake Designs, has graciously sent us a bundle of fat quarters (pictured below) to be given away to one lucky winner. Thank you Cindy! 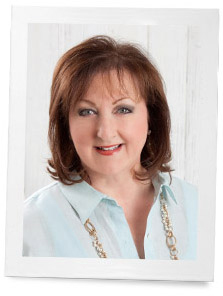 Be sure and visit her websites and see the beautiful collections of fall fabrics. To enter, share this post via one of the social media buttons below, and then leave a comment with whether or not you collect quilts or quit yourself. Write about it on Facebook, pin it to your favorite board on Pinterest or even send a tweet. Not a social media person? Just leave a comment instead. Best of luck! I believe I have enough fabric to insulate my attic but I am always on the look out for wonderful fabrics! How kind you are to offer to share it with one of your readers. 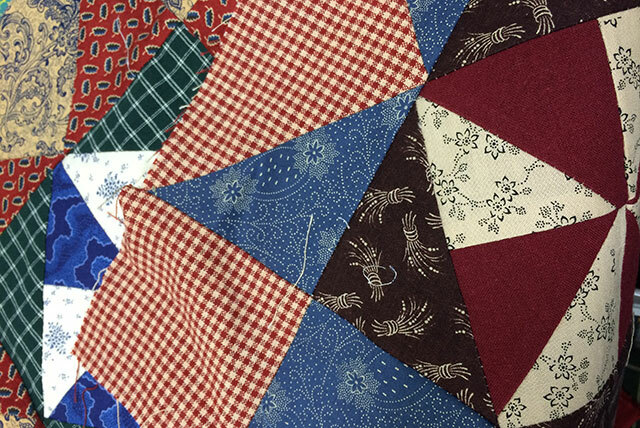 I have been quilting for years and especially love the civil war reproduction fabrics. I have been quilting for years and especially love the reproduction fabrics. Reminds me of the quilt my great-grandmother made for me–love the fabric! Ohhh, such beautiful fabrics! I’ve done some quilting and would love to do more. I love your blog, Phyllis, and look forward to every entry. I’ve just started quilting but it meets all of my requirements – therapeutic, creates a unique gift to give others and a wonderful creative outlet. I also love Civil War fabrics. I do Civil War re-enacting and I love to sew, but I haven’t made a quilt yet. My passion is quilting and I love cilvil war era fabrics. I made a quilt using Judi Rothermel fabrics with a flag border….my favorite quilt. I love many of the Riley Blake fabric collections, especially this one. I like using 30’s reproduction fabrics and want to try Civil War fabrics in my quilting projects. Now if I can just carve out some time to quilt this fall. harder to organize my time. Hi, yes I’m a quilter+love quilts of all sizes! Thank You for a beautiful bundle Giveaway! I’ve only made 2 quilts in my life,with one in the works. The first one was a collage of fabrics from scraps that were leftover from all the dresses, pants and shorts that I made for my daughter. it was for school to take a nap, that was 1974. The next one was made by my M-I-L and myself for my new house in 1987, now used in my daughter’s guest room. The last is a rag quilt made of old looking materials, pieced together with seams out, washed and the seams get ruffled, this quilt is for the boys ages 6 and 3. I hope to have it finished before they marry, lol. Quilting is not my passion but I do love the results. One last item, my M-I-L was an avid quilter, all her quilts were hand stitched, all 4 children received one for a wedding gift, and one for each grandchild, still in use I might add. You could not ask for a better gift. Some friends and I have just formed a sewing group and I have been thinking about doing a jelly roll race quilt, but those fat quarters look pretty juicy! I love these quilt fabrics and cooler weather is a great time to start one. I have made several quilts. My first one in a quilting Bee with some ladies when I lived in Missouri. Most fun time in my life! I love to quilt and the Fall is when I get more in the mood to quilt. 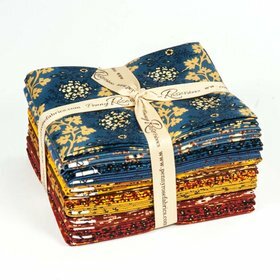 I have never used Civil War Fabrics but they are beautiful. I have made my husband and two sons quilts as well as other family members. I have quilted since high school! I love it. This Civil War Time’s line is indeed scrumptious! I don’t quilt but have been given quilts lovingly made by friends…each one different and meaningful…that’s what I love about quilts! I have been reading a great series by Jennifer Chiaverini…Elm Creek Quilts novels…blending fiction and history. In fact, I am now rereading The Union Quilters. Anyone interested in quilts or quilting would enjoy reading her wonderful stories. I still have the handmade stitched quilt that was on my bed as a child and I treasure it!. 60 years later it still brings back warm memories. I love quilts & have several made by my Mother & grandmother. They make a room seem so homey & bring back fond memories. Nothing says home and comfort more than a lovely quilt! To me they are are also beautiful used in decorating and as wall hangings. Many times they speak to the observer through intricate details. I love the stories they tell. I am a novice quilter. Several years ago I made a doll quilt for my granddaughter, my first attempt, and enjoyed the process, especially the hand quilting. In the last two years, I made a quilt for each of my two younger grandchildren. With the Winter approaching, I am now thinking of what I might do for the next project. I have a quilt that my grandmother made for me about 35 years ago. It has pieces from my first dress with “darts,” some of my mom’s dresses and fabrics from my grandma’s aprons. It is very special to me. She passed away in 1979. I will keep it always. I have made many Quilts & my Grandaughters all have one or more. I have seasonal Quilts for our bed ( Xmas, Fall, Spring & also a Scrappy Quilt ) & right now I am working on another Xmas Quilt. I wonder who will get this one next Xmas ??? It is oh so lovely. Your article brought me such pleasure. My grandmother taught me how to quilt 40 something years ago. I still feel her presence whenever I’m piecing, quilting or just touching wonderful fabrics such as in your journal article. Thanks for sharing! While I do like the Civil War repros the ’30s repros are the ones that speak to me. I think it’s because I played with my grandmother’s scraps as a child, and there were a lot of ’30s prints in amongst her scraps. As another quilter pointed out to me several years ago, ’30s prints are just happy prints and they make you happy when you work with them no matter what mood you were in when you started. Can’t wait to see your finished quilt(s)! I quilt and have made two Civil War fabric quilts. The fabric is always steeped in colors that bring a smile to my face and makes me long to start a new quilt. When leaves fall in an extra layer over sleeping garden beds, the quilts inside are pulled up in proportional layers. What a lovely saying, thanks for sharing. Hi. I too love quilts and have made some over the years. I hope to do many more when I retire! It all started when I was lucky enough to rescue some family pieces from my husband’s grandmother’s stash. Quilt shows are a feast for my eyes and I seek them out when traveling! I love quilts as well! My first was one that my grandmother made well before I was born. It is a crazy quilt made from scraps of clothing – wool, flannel, cotton, and backed with an old flannel blanket. Since then I have collected many more – a c. 1930 flying dishes, a c. 1890 indigo quilt top and several newer quilts. One of these days I will try my hand at quilting! Several of us in my family just had an on-line discussion of the quilts given to us, mostly by my mother; their grandma. Quilts are a warm, wonderful hug full of memories. Totally inspiring. Lifted up my spirits today to see this beautiful fabrics! I am a beginning quilter pretty much…have done small thing tho. Have only made 2 big (twin size) quilts…and Stitch-in-ditch quilted. I do have 2 old quilt tops…hand-pieced by a dear gma friend few years ago…HER Gma had made them! Definitely a Treasure to mt Heart! I have just retired from teaching for 24 years and loved every minute of it! I dug out all my old sewing and quilting things that have been untouched over the years. Slowly, but surely my fingers are remembering what to do! I forgot how relaxing quilting could be! I am amazed at all the beautiful fabrics out there. My next quilt is going to be Civil War as I taugh fifth grade social studies! I’m so fortunate. My Mother and Aunts were quilters so I have a few all-by-hand quilts from them that I treasure. I am learning to quilt (what took me so long to get going?!) I am also fortunate that a friend gifted me 1880’s quilt squares (hand made by her family) to be made into a quilt. Now that project scares me! I agree, Fall and Winter bring out my desire to get back into quilting as well. I am somewhat impatiently waiting for a copy of the “Civil War Sewing Circle” that I recently ordered on line. I have a bundle of fabric from my local quilt shop that is a reproduction of Civil War dressing gowns – simply lovely. As much as I love to piece a quilt top, admittedly, I hate to take apart the beautiful bundles of fabric that the ladies at the quilt shop have so creatively designed, tied together perfectly with raffia or grosgrain ribbon; silly I know. Have a wonderful Fall and enjoy your precious stollen moments for quilting. I have been quilting for over 50 years and have lost count of how many I have made. I give all my quilts away, usually to those not as lucky as I am. All my family members have one of MY quilts. One for every occasion is my motto and also use them as table toppers. Love love love to quilt. would love to win some free beautiful fabric. I am an avid quilter and have made a quilt using the civil war fabrics. My main attraction is needle turn applique quilts. I have appliqued and hand quilted a Baltimore Album quilt by Elly Sienkiewicz. It was the most fun. I am working on some appliqued baby quilts at the present time. It is wonderful that you are interested in quilting. It is a wonderful art. I LOVE quilts!! When I see a quilt and the work that has gone into it, I know it’s from the heart! Enjoy your blogs, Phyllis, thank you! I collect family quilts and have several that are turn of the century. I make quilts and collect them. They speak to my heart.